Jabu, our 31 year old African Elephant rescued bull, has been diagnosed with Angular Limb Deformity (ALD) and mild carpal (wrist) osteoarthritis. As many of our followers know, we are trying to manage the arthritis in a few ways. For the past recent months, we have been administering a joint repair and support drug called Pentosan Polysulphate. We feel it has provided some benefit to his wrist joints and will continue this regime as long as we see progress. Thank you to our donors who help fund this expensive, safe and novel medication! Sandi is also busy finding a spot to dig a therapy swimming pool for Jabu. We have been advised by elephant vets in our consortium that swimming will help - much like it does for people and dogs suffering from arthritis. It's important to get weight off his limbs, strengthen weakened muscles and encourage wrist and shoulder range of motion. Sanctuary Retreats are providing logistical support to get this pool built! Thank you Sanctuary Retreats. We are also getting a customized leg therapy wrap from Back on Track made for Jabu! This popular product is used with horses, dogs and humans recovering from sport injuries and arthritis. It uses far-infrared energy to increase circulation and therefore recovery. It's the first trial of this fabric on an elephant. Since elephant skin is very thick, we aren't sure if Jabu will feel the effects, but we are willing to try this safe, donated and customized item! Thank you Back on Track. We will post more about the outcomes when it is complete and arrives to our remote Botswana location! It really takes a large human herd to help Jabu. These wraps, drug and physiotherapies will help address the arthritis and associated pain and inflammation at the wrist. Simultaneously, we have to consider the over arching and more difficult issue of Jabu's angular limb deformity (ALD). Dogs, horses and humans experience ALD like Jabu and there is moderate information and case studies on this condition and treatments. Dr. Dean Hendrickson, one our advisors, authored this publication that explains the condition in detail. Finding information on ALD and treatments in elephants, however is proving difficult. We are walking in new territory. If you can imagine the two long leg bones (radius and ulna like in our arms) stretching down from Jabu's shoulders that end at his wrist. With ALD, it is possible that one of those bones grew faster, and therefore longer than the other, possibly, or there might have been damage to the growth plate at which they join to the wrist. As a result of deformity in the distal radius, the wrist collapses outward, and the foot flares out, so to speak. This deformity causes Jabu to carry too much weight on the inside of his leg joints and he becomes unstable walking. This then creates further degradation of the wrist joint and causes him to scuff his toe nails and be prone to toe nail infections. So, conformation is everything. Jabu's stance is compromised with ALD. You can see him try to find a stable position here. If Jabu is still growing (and he could be at 31 years old), like a young foal, then surgery is a possibility to help correct his limb deformity. This is a relatively common procedure in young horses with carpal valgus. Since surgery is dependent on growth plates still being open, we need to know if he is still growing. Ideally we could capture this in radiographs. It is extremely difficult, and might be impossible, to get a good clear radiographic image of his growth plates since the penetration needed pushes even the largest portable machines to their max capacity. Our wonderful team is reviewing Jabu's images and we hope to have more information soon. Unfortunately, there is extremely limited data on growth plates for elephants. 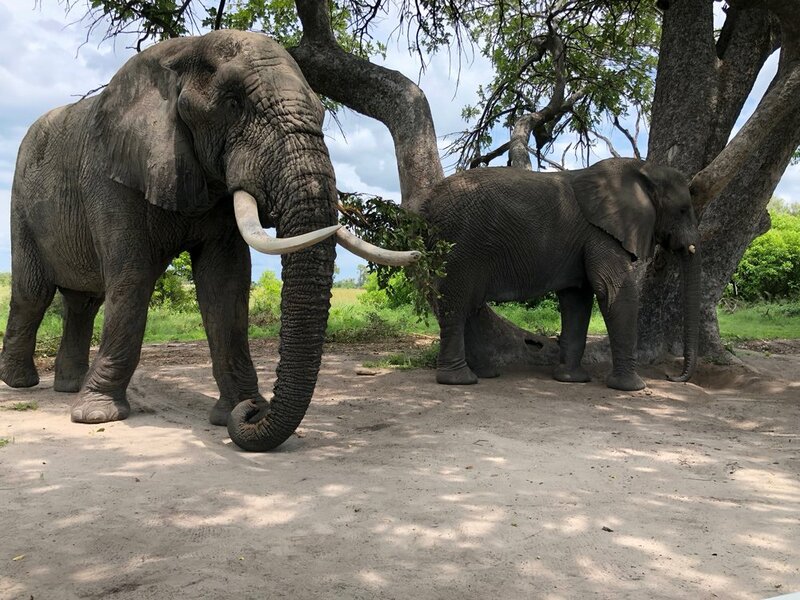 If we rely on preliminary research, we can ascertain that at age 39 years an African bull elephant's distal radius growth plate should be closed. We are reaching far and wide for information on this very defined topic along with our friends at Saving the Survivors. Dr. Hutchinson from the Royal Vet College has been forthcoming in providing data from places we would never know how to find. Thank you Dr. Hutchinson! We will continue to dig deep into this question. ALD surgery would not be an easy task and has its own associated risks. We do however have the world's best surgeon in this regard lined up if Jabu would need it. Doug and Sandi and our local vets will consider all information before attempting such a feat in the bush and at his age and size. We will continue to keep you updated.